If you’re a meeting planner tasked with planning a corporate event or team building activity in the Jacksonville area or on Amelia Island, it can be challenging to find activities for large groups that are fun and exciting – especially if your goal is team bonding. Typical team building and team bonding events are often not a hit with attendees and many event planners are simply running out of fresh options for their clients and guests. Nature-based or adventure activities offer an opportunity for “organic teambuilding” in which all the goals of a team building event are achieved naturally during the activity – without a compulsory agenda. Here are three fun ideas for group outings in Northeast Florida that are sure to make your event a BIG success. 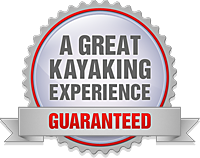 Large group kayaking trips give your team an opportunity to get together away from work and in a natural environment where they can unwind and relax while having fun. 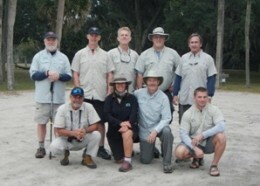 Adventures Up The Creek has been providing large group kayaking trips in Northeast Florida and Southeast Georgia for over 21-years with a perfect safety and customer service record – making Up The Creek the go-to provider for kayaking on Amelia Island and in Jacksonville. 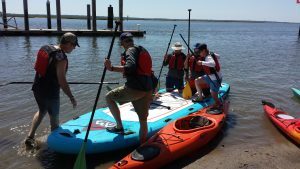 With multiple paddling locations in and around Jacksonville and Amelia Island, Adventures Up The Creek can customize a kayak outing for any group. Using a combination of single and tandem kayaks, Up The Creek can accommodate up to 24 paddlers –and sometimes even more. Larger groups may add additional trips or use a mixture of kayaks and canoes to accommodate everyone. Big Canoes, also referred to as, “Voyageur Canoes,” or “War Canoes,” offer a fun and totally unique opportunity for groups of 6-18 paddlers (or up to 20 on lakes). 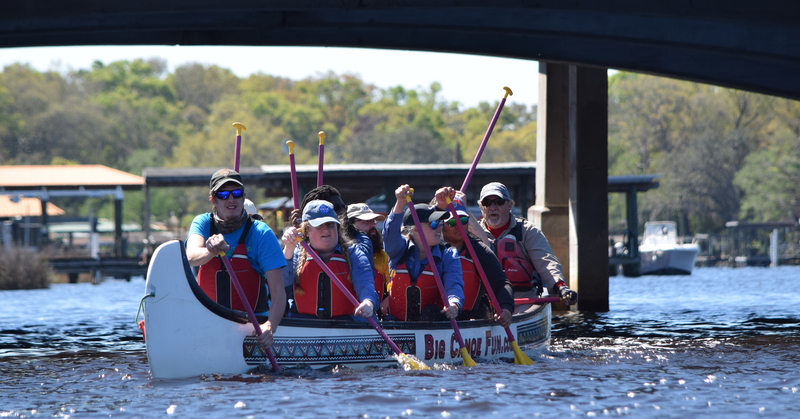 Big Canoe Fun is the only operator of War Canoes in Georgia and Florida and has two, 25-ft. long, Voyageur-style canoes built for big water and big events. Whether your group has a competitive edge and wants to race, or simply wants to get out on the water together, Big Canoes are the ideal platform. With up to 9 guests in each Big Canoe with a guide, paddlers of practically any age or skill-level can participate together as a group every step of the way. From boarding and launching to paddling and docking, every part of a Big Canoe trip requires teamwork and communications — creating an ideal environment for team building. Paddling the Big Canoes allows groups with varying levels of skill and experience to work together as a unit and travel together at the same pace – no matter what conditions are experienced. Paddlers who may not feel comfortable paddling a kayak in the St. Johns River in downtown Jacksonville would have no problem on that same trip in a canoe with several other people. Likewise, trips that may be too strenuous for some members of your group to do in a kayak are a breeze in a Big Canoe – teaching a fundamental team building lesson: “Many hands make light work.” Popular trip venues for the Big Canoes include, Downtown Jacksonville, Crooked River State Park and Egans Creek on Amelia Island; but the Big Canoes can be paddled anywhere there’s a boat ramp. On lakes, the canoes can even be raced with up to 10-attendees in each boat. 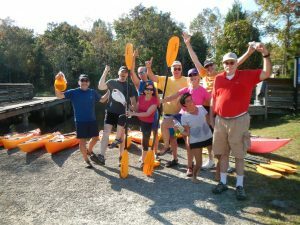 Check out http://www.BigCanoeFun.com for more information or to start planning your next group event. Amelia Mega SUP has two of the largest SUP’s (Stand Up Paddleboards) in the Southeast available for group events and team building games. Measuring over 18-feet in length, Mega SUP’s are rated for up to 8 adults each – but can accommodate more than that for some team building applications and games. Groups of 4-16 could actually paddle these Mega SUP’s on some of the waterways in the area, but they are especially suited for games and challenges on lakes and smaller bodies of water. Because of the nature of SUP’s and the games people play with them, falling in the water is always a definite possibility; so Mega SUP activities are recommended for warmer months and warmer water. Visit http://www.AmeliaMegaSUP.com for more information on Giant SUP trips and activities. 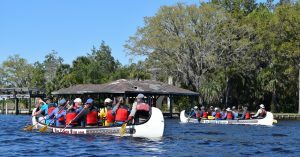 Meeting and event planners looking for group activities in Northeast Florida, including Jacksonville and Amelia Island, can rest easy knowing they have access to some of the most fun and unique outdoor, on-water offerings in the region. Paddling exposes your group to new environments and situations in which they can communicate, work together and then share memories and stories of their adventure together. When visiting the coast – or the River City – getting out on the water is truly the only way to get the most out of your visit and see the best nature has to offer. And, with nature-based activities like canoeing and kayaking, keeping attendees busy and entertained is a breeze.